London: British Film Institute, 2014; PB. Order the paperback from Amazon.co.uk, or from Amazon.com. Part of the BFI Film Classics series. Before 2001: A Space Odyssey and Doctor Who, Quatermass and the Pit was the paramount British science fiction saga in film and television. 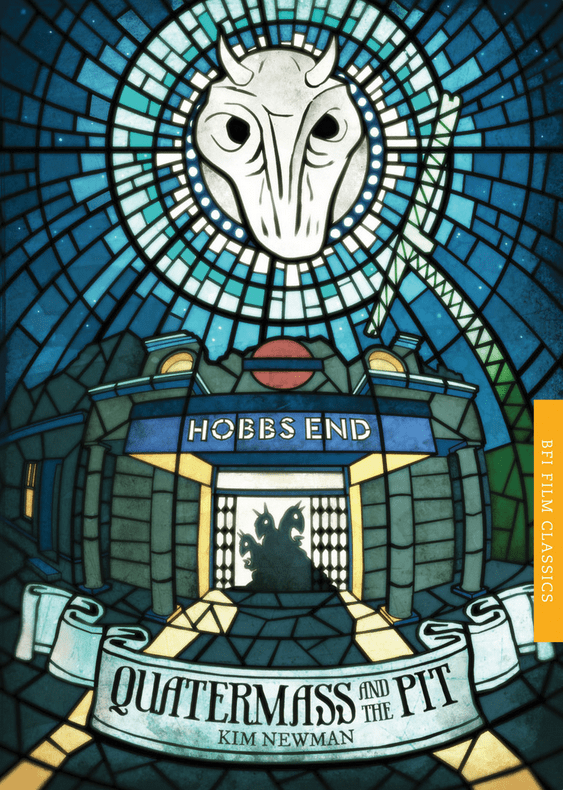 Kim Newman’s fascinating study focuses on Roy Ward Baker’s 1967 film, written by Quatermass creator Nigel Kneale for Hammer Films, but also looks at the origins of the Quatermass franchise in 1950s BBC serials and earlier films. Exploring the production and reception of the film and series, Newman assesses the lasting importance of this landmark franchise. London: Bloomsbury Publishing, (2 edition) 2011; PB. In this new edition, Kim Newman brings his seminal work completely up to date, both reassessing his earlier evaluations and adding a second part that analyses the last two decades of horror films with all the wit, intelligence and insight for which he is known. Since the publication of the first edition, horror has been on a gradual upswing and has gained a new and stronger hold over the film industry. Newman negotiates his way through a vast back catalogue of horror and charts the on-screen progress of our collective fears and bogeymen, from the low-budget slasher movies of the 1960s, through to the slick releases of the 2000s. Nightmare Movies is an invaluable companion that not only provides a newly updated history of the darker side of film but also acts as a truly entertaining guide with which to explore the less well-trodden paths of horror and rediscover the classics with a newly instructed eye. London: BFI (British Film Institute) Publishing, 2005; PB. Part of the BFI TV Classics series. Order the paperback from Amazon.co.uk or from Amazon.com. In this comprehensive study, Kim Newman follows the Doctor’s travels through time, examining outstanding stories as well as prominent themes, recurrent characters, and monster types to assess the show as television masterpiece and cultural phenomenon. Packed with photographs of the most terrifying scenes in cinema history, this unique, definitive, comprehensive guide traces the story of horror over the past century, decade-by-decade, and provides a witty and informative critique of over 250 films, plus any TV series and literature that informed them. And with feature spreads on related themes appearing throughout – from vampires, ghosts and comedy horror, to the occult, giallo, cannibalism and serial killers – this book offers a superb introduction for beginners as well as something new for the die-hard horror fan. The book features one hundred of the top names in the horror field discussing one hundred of the most spine-chilling novels ever written. Each entry includes a synopsis of the work as well as publication history, biographical information about the author of each title, and recommended reading and biographical notes on the contributor. In his foreword, Peter Straub says this follow-up to Horror: 100 Best Books arrives when “a sophisticated contemporary reader” is more likely to consider genre fiction than ever before. Order the paperback from Amazon.co.uk or the hardback from Amazon.co.uk. This volume, part of the Sight and Sound Readers series, provides a diverse overview of trends that have shaped sci-fi/horror since the 1990s. Topics covered include: vampire movies, body horror, the nuclear “threat”, childhood terror, artificial worlds, and postmodern horror. The book also takes a fresh look at such classic movies as Rosemary’s Baby, Psycho, Halloween, Nosferatu and Blade Runner, as well as covering 90s highlights such as the Scream series, I know What You Did Last Summer, Strange Days, Existenz and Cube. The American edition of Millennium Movies. Part of the BFI Classic series. An illustrated survey of how cinema has dealt with the idea of Armageddon, from WWII nuclear movies and atomic spy flicks, through 1950s monster movies to World War III, Cold War anxiety and post-Holocaust tales. It includes “Pre-Millennial Tension” epics like Independence Day and Armageddon. This book provides a valuable history of the horror genre from its genesis in the 18th-century gothic novel, through to the Victorian ghost story, and onwards via 100 years of film. In addition to entries on actors, directors, writers, technicians, horror-themed films and television series, the book provides essays on classic horror characters like Frankenstein and Dracula, and on recurrent situations like decapitation and body-snatching. From his acclaimed study of horror films, Nightmare Movies, Kim Newman turns his attention to the Western. Against the backdrop of American history, popular mythology and the development of the cinema, the book examines the main themes and tensions of the genre. With reference to thousands of films and hundreds of directors and actors Newman brings his entertaining, wide-ranging and authoritative approach to bear on one of the cinema’s most popular genres – with illuminating results. UK: Bloomsbury, 1988; PB. ISBN: 0747502951. In 1968, George Romero’s Night of the Living Dead and Roman Polanski’s Rosemary’s Baby brought a new slant to the horror film, bringing zombies and witchcraft into a contemporary setting, and much closer to home than the cardboard Transylvanias of earlier films. This work is a critical overview of the horror movie genre from the late 1960s with a discussion of over 2000 films – masterpiece and monstrosity alike. USA: Carroll & Graf, 1988; HB. A collection of essays written by a hundred of the world’s top horror, science fiction and fantasy authors and critics on his or her favourite horror book. A book of science fiction quotations from literature and film.